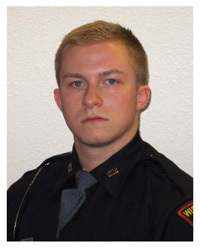 In the late afternoon hours of March 24, 2015, Trooper Trevor Casper of the Wisconsin State Patrol located the vehicle of an armed and dangerous suspect the FBI and Michigan authorities had been searching for in relation to numerous bank robberies and a homicide. He began to follow the vehicle from a distance, without any emergency lights or sirens, while waiting for backup to arrive in the area to assist him in making a traffic stop on the suspect’s vehicle. With Trooper Casper following, the suspect made a sudden turn with his vehicle, went back in the direction of Trooper Casper, and fired upon him. After being shot by the suspect while still seated in his cruiser, Trooper Casper then exited his cruiser to engage the suspect. The suspect shot at Trooper Casper several more times, delivering what would turn out to be fatal wounds to Trooper Casper, and Casper was able to return fire and fatally shoot the suspect. This was Trooper Casper’s first solo shift after his field training and was sadly his last, after lifesaving measures were unsuccessful.